Last week, while out and about near her home in Italy, Sabrina la Grotteria witnessed a scene that touched her heart. And soon, it touched the heart of a nation as well. 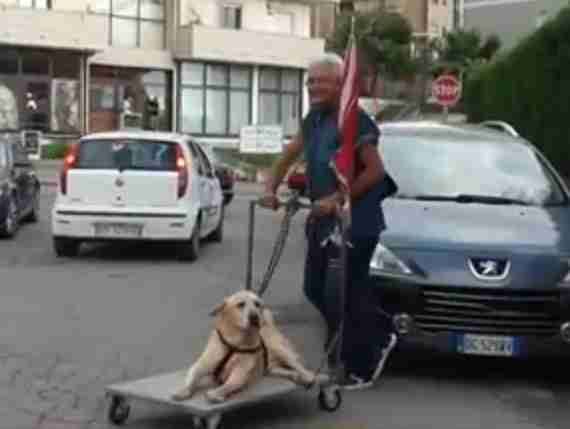 There, on a quiet road in the city of Vibo Valentia, was an older gentleman pushing his dog along in a cart, the pup apparently unable to get around on his own. Grotteria began recording a video as the pair arrived home at the end of a walk. 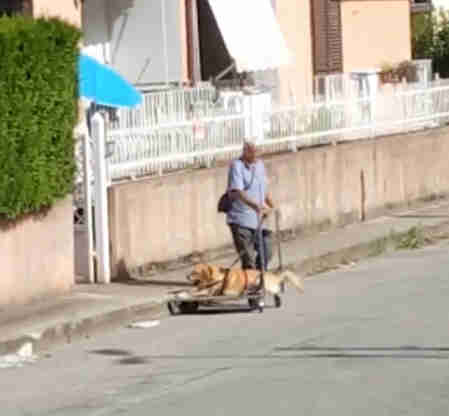 Though the clip is brief and shot from afar, that snapshot of their daily routine, and the man's dedication to helping the dog cope with his disability, is teeming with love like few others. "I was so moved that I decided to post it on Facebook," Grotteria told The Dodo. That's where the touching scene went viral. Before long, Grotteria's video of the man and dog had been viewed hundreds of thousands of times — generating headlines across the country as a gesture "that moves Italy." Though Grotteria didn't know the pair, local news outlets were able to track them down to learn their story. The man, named Tonino Vitale, has been walking his 13-year-old dog, Dylan, like this every day ever since Dylan lost the use of his rear limbs due to arthritis. Vitale was surprised to learn that so many were moved by the video, but he hopes it sends a message. "With Dylan it was love at first sight, ever since it was born," he told the newspaper Il Vibonese. "For us, it is a normal gesture to love Dylan, but we are happy to let you know his story. It is a way to sensitize people to the importance of respecting the animals." Here's Vitale again, speaking with LaC TV (in Italian). "This video contains only one word: 'HUMANITY.'"